With European stocks surging to levels not seen since last August, the European economy continues to slump ever closer to recession. ... on Wednesday Germany's leading economic institutes slashed their growth forecast for Europe's biggest economy by 60%, to 0.8% from a previous estimate of 1.9% a source told Reuters. 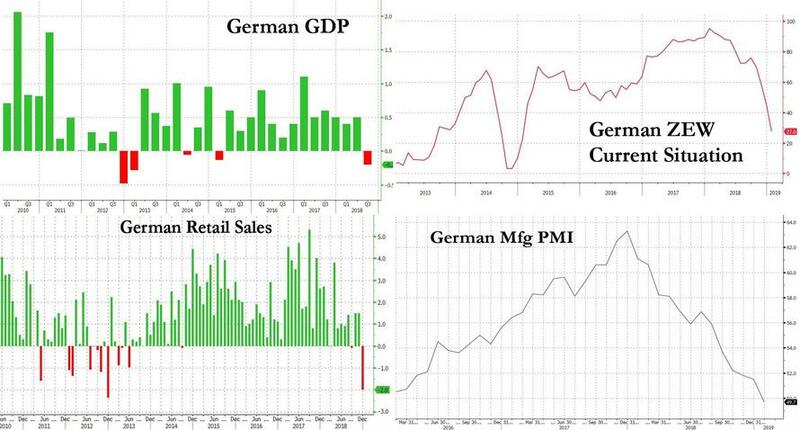 The sharp revision reflects the scale of the slowdown in Germany, whose economy continues to tread recessionary waters and is facing headwinds from a slowing world economy, international trade disputes and the threat of Brexit. As Reuters adds, the institutes' estimates feed into the government's own growth projections which will be updated later this month. The government said in January it forecast growth of 1.0 percent this year. ... yet wonders if this latest outlook cut may be coming too late - according to the Citi Eurozone econ surprise index, while it remains deep in negative territory, the index had posted steady improvement for the past three months, which however hit a brick wall at the end of March. Ultimately, Germany's fate will depend entirely on whether China's economy has indeed troughed or if the recent PMI rebound ends up being a transitory spike, one which will be promptly squashed by the economy's downward momentum.